The official Black Lives Matter organization has entered into a strategic and creative partnership with J. Walter Thompson New York, marking the first such pairing on a formal assignment. The relationship kicked off with the beta launch of Backing Black Business, a web tool that lets users discover black-owned small businesses throughout the country. JWT New York picked up the pro bono assignment for the nonprofit advocacy group without a review after reaching out to the organization directly. "[The partnership] started with four creatives who had a passion to support Black Lives Matter," JWT New York CCO Brent Choi said. "They came up with an idea, and we presented it to them. Through a number of conversations, it became clear that we didn't just want to offer ideas, but to be a partner to the organization and the movement. We believe in the power of ideas to change behavior, so this relationship became a perfect marriage." Choi said the plan involved a long-term partnership, adding, "As the Black Lives Matter cause is ever-changing, our scope will as well. It is open-ended, but our mandate is to create meaningful communications to support Black Lives Matter and their cause." Artist and advocate Patrisse Cullors, one of the co-founders of the official Black Lives Matter organization as well as the larger BLM movement, said, "We're thrilled to partner with J. Walter Thompson and in particular this effort to uplift and sustain black businesses. 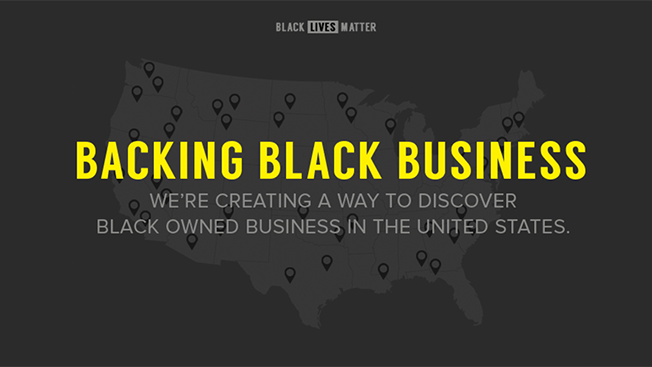 Right now, we need to invest in black businesses more than ever." The Google Maps-based Backing Black Business effort aims to help users support entrepreneurs in their vicinity while simultaneously highlighting racial disparities in business ownership. Its beta version launched yesterday with over 300 individual businesses represented. "Our hope is to reduce the racial disparity that exists in economic well-being through the promotion of Black business ownership," Choi said. The announcement comes at a time when JWT looks to focus on diversity as a way to move the general conversation forward. Much of the news surrounding the agency this year concerned the ongoing discrimination lawsuit filed by global communications chief Erin Johnson against now-former CEO and chairman Gustavo Martinez. Tamara Ingram took over as global CEO after Martinez resigned and immediately promised that "diversity and inclusion will be at the top of my agenda" before laying out her plans for a Diversity and Inclusion Council in May. JWT and Black Lives Matter plan to work together throughout 2017, and the press release calls it "[a year] about building Black power." But Choi's comments seem to suggest the agency sees the potential for a much longer relationship. Asked if the outcome of the 2016 election impacted JWT's strategy for Black Lives Matter going forward, Choi said, "Nothing has changed. Everything has changed. The team at Black Lives Matter have a lot to do regardless of who won the election. Our collaboration will focus on what we can control and the ways in which they need our support." Choi said the assignment is different than that of a typical nonprofit "for a number of reasons, but mainly because they are trying something new by working with us, and we have a lot of creative freedom given [their] iterative approach to communications." "It's been challenging and at the same time I think this partnership has been enriching for both teams," he added.